We had an unexpected surge in the temperature over the weekend - a shockingly blazing sun in a shiny blue sky, making people scramble in their drawers for tank tops and causing all the green grassy parks to be suddenly carpeted with sunbathers. It's supposed to be colder in San Francisco when summer approaches, not brutally scorching. Of course, what better inspiration than Emily Luchetti's A Passion for Ice Cream ? I zeroed in on a recipe I'd earmarked earlier, for some ice cream sandwiches made from lemon ice cream spread between gingersnaps. Icy, tart, lemon sounded just perfect to combat the heat, and gingersnaps are my sweetie's favorite cookie, so this was a no-brainer. Or so I thought. When I told him what recipe I going to make, my boyfriend sounded a little hesitant, then admitted he wasn't so sure about the lemon ice cream. Couldn't I make it another flavor? Normally, I would have indulged him, but this time I was surprised. Who doesn't like lemon? Tall, frosty glasses of lemonade, jewelike French lemon tarts, sour lemon candies...I was going to convince him to try it! Upon starting the recipe I decided to make a lemon sherbet instead of an ice cream as it sounded even cleaner and more refreshing. I was very pleased with this version, as it is beyond simple to make - no stovetop required, just a combining of milk, cream, sugar, and lemon - and a marvelous restorative in hot weather. Pleasantly tart, luxuriously light and creamy, it slides effortlessly down your throat, sending the sweetest of frissons down your spine. With my new ice cream machine, I didn't even have to chill the mixture beforehand - it churned perfectly in just 30 minutes! The gingersnaps prove worthy bookends to the sherbet - comfortingly sturdy, crackling satisfying under the bite to provide a crisp contrast to the smooth filling. 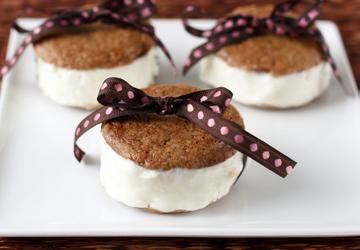 The spicy flavors of the cookie also work well against the clean, citrusy taste of the sherbet. Combined, these two parts form the perfect antidote to a surprise of a sweltering day. "No, you've got to wait until I make the cookies and we can put the sandwiches together." I replied. A wistful look was the only response. I'll take that as an endorsement of lemon sherbet! Oh my goodness, I am such a sucker for both gingersnaps and lemon sherbet. It's a marriage made in heaven! But your sandwiches look *almost* too pretty to eat. Just because I'm curious, what kind of ice cream machine do you use? This is the year I'm going to buy one, you see. 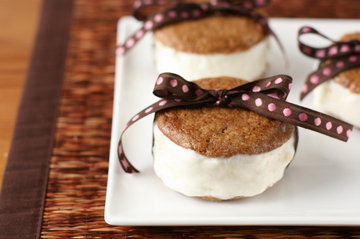 Ice cream sandwiches? oh how I love you. Ice cream is the world's most lovely food. And yours are the most lovely ice cream sandwiches I have seen. They're just gorgeous! Let ice cream season begin!!! So that's where our good weather went. I think I deserve one of those as consolation for the rain pouring down outside! Yup. That's what I want for Mother's Day. Exactly as pictured. I think these would be my favorite dessert ever. Lemon AND gingersnaps? (that's what they have on the menu in my personal version of heaven). Can you please open up a sweets shop, so I can come and buy these? oh my! i swoon for anything with lemon...gorgeous photos, as always i can expect nothing less from you! i love the ribbon, too...it's the same ribbon i use all the time (gold/maroon for holiday gifts and pink/brown for everyday gifts). you have great taste! They are gorgeous! We must shop at the same ribbon store...:)B. has the same reactions when I pan some desserts, then for seconds. I'm not much of an ice-cream girl but go for lemon all the time...especially lemon sherbet. Looking so cute with the ribbons..
Ugh...our surge is coming...and I do not look forward to it. Perhaps I will feel better if I make these little treats. Oh Anita, these sound so wonderful - and just the right treat to beat the unexpected heat! Gingersnaps are one of my all time favourite cookies - so to pair them with lovely lemon sherbet is to raise the bar even higher! Gorgeous! So, I wonder.. if I didn't have an icecream maker, could I still make sherbert? Thank you! I have both a Cuisnart ICE-20 insert-style and ICE-50BC commercial style ice cream makers - see my post from Jan. 13 of this year for a discussion of them. The commercial style is an investment and the insert style works perfectly well if you're on a budget! Thanks! I can't wait to get the ice cream maker in high gear! I'd happily send one to you if I could figure out how to keep it from melting - at least you should know our typical fog has started rolling back in! That's great you made a lemon convert too:) I love watching people change their opinions on food. Hope you enjoy making the sherbet! Thank you! Emily's books are always a great inspiration to me! Thank you! I found that ribbon too adorable in the store - you must have the most beautifully wrapped gifts for people! Thank you for the birthday wishes! Thank you! I think it's a wonderful combination, when I get a chance to come to HK I'll make some for you! Thank you! Got to find a way to beat the heat - I may be turning my ice cream maker into high gear come summer! Thank you! I found the gingersnaps went well with the lemon - and both are great on their own too! 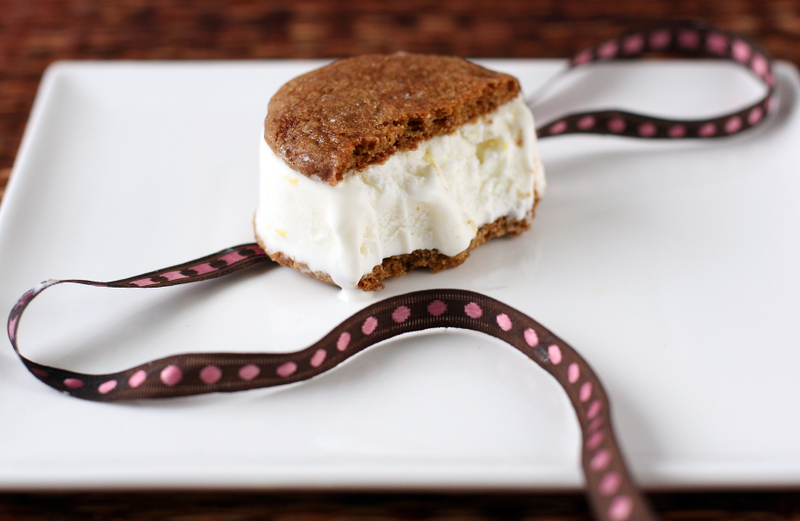 Who doesn't love Ginger cookies AND Lemon sherbert and what a terrific combination! Thank you! I'm glad you like it and hope you get to try making it!